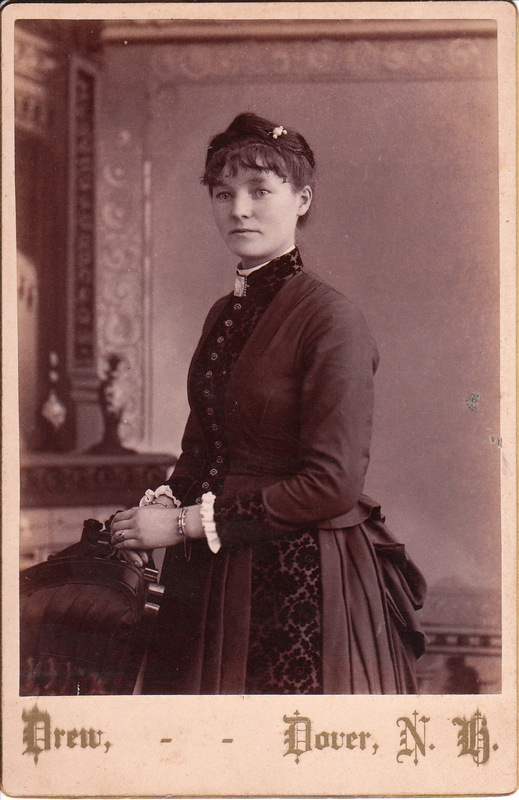 A pretty and nicely dressed woman poses for her portrait at the Drew studio in Dover, New Hampshire. The subject of this image enjoys her jewelry as can be seen by her ring and the bracelets on both of her wrists. To learn more about A. P. Drew and to view more of his photographs, click on the category “Photographer: Drew”. An angelic looking young girl dressed in white, poses in an artistic portrait at the Drew Studio in Dover, New Hampshire. The little girl does not appear very happy about the process of being photographed. She has corkscrew curls and is wearing hair ribbons. 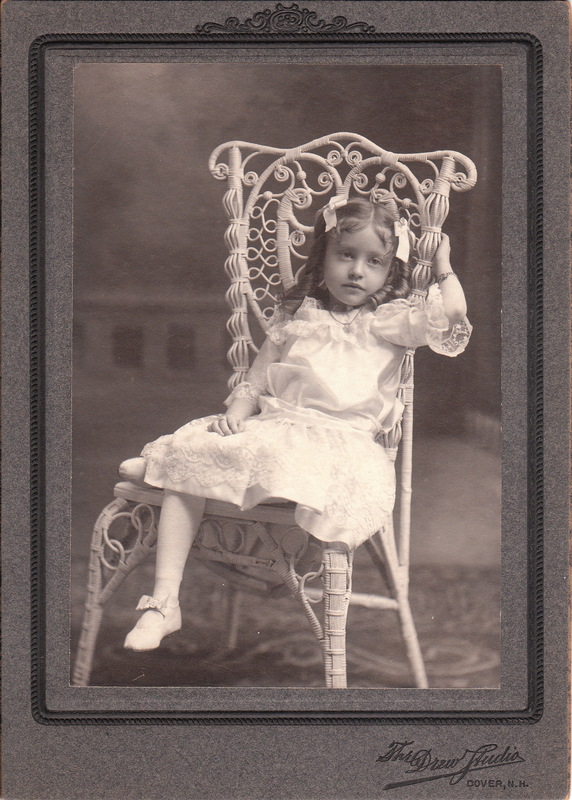 She is sitting cross legged in a white wicker chair. The photographer of this large format image is A. P. Drew. The Dover Enquirer (1896) has an article which mentions Alfred Palmer Drew. In 1896 a “deluge” and subsequent fire destroyed a business block and three bridges in Dover. The flooding sent the stores on the block down the Cocheco River. The photography studio Drew and Boomer was among the stores washed away. The Bulletin of Photography (1917) contains the obituary of A. P. Drew. He died at the age of 81. He had been born in Dover and had worked as a photographer there for more than 50 years. He retired in about 1914. During the civil war he had been a member of the Strafford Guards. The regiment was originally established in 1822 and a year later became part of the New Hampshire State Militia. In 1864 the Strafford Guards were mustered into service of the Union Army for a period of sixty days. They relieved a New Hampshire artillery unit that had been sent to the front. A. P. Drew served as a corporal.